We've just returned from a fantastic weekend at Thornton Hall Hotel & Spa, a luxury hotel about ten miles south of Liverpool. I'll have a full review up in the coming weeks. 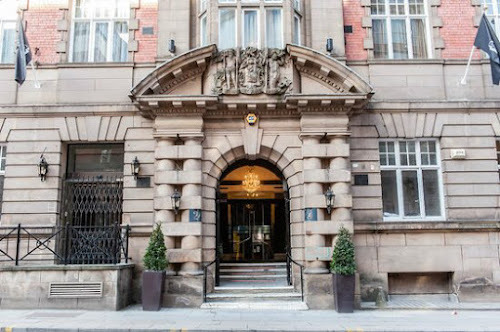 Just before we went, one of the PR companies that I have worked with in the past, shared a write up about one of the businesses that they look after in Liverpool. The Richmond Liverpool is a luxury hotel and spa which offers both hotel rooms and self catering apartments, conference and banqueting suites, all housed within a beautifully restored Grade II listed building on Hatton Garden, just a few minutes walk from the busy shopping area of Liverpool One. The venue also plays host to 'R Bar & Brasserie', a stunning atrium restaurant serving light lunches, champagne afternoon teas, cocktails and top quality dining using the best produce that it can source locally. 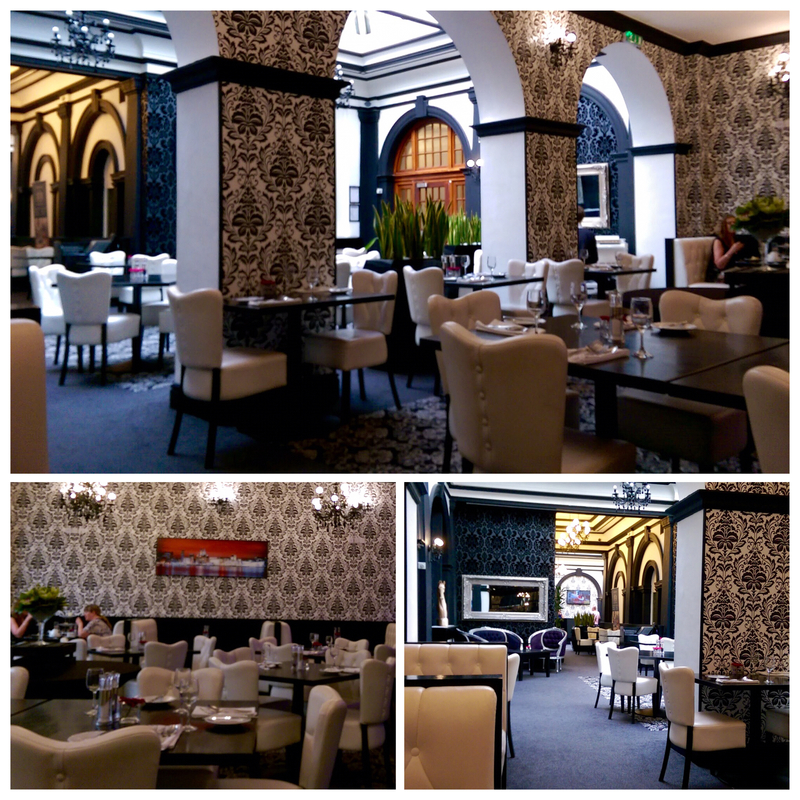 The restaurant looked lovely and as we had plans to go into Liverpool for a spot of sightseeing and shopping, I hatched a plan to grab something to eat before we made the long drive home to Glasgow. Fortunately for me, R Bar & Brasserie has just launched a new Sunday Roast menu and they were keen for us to head over for an early dinner. After wandering around The Albert Dock and the main shopping streets of Liverpool, a city that we will definitely be returning to, it was almost time for lunch and after a slight detour past the wrong Richmond, we reached our destination. The interior design in the restaurant is very classy with cream leather upholstery, black wood and flock wallpaper filling the atrium nicely. When we were shown to our table at 3:30pm there was only one table occupied but by the time we left, the restaurant was proving popular with Liverpool diners. 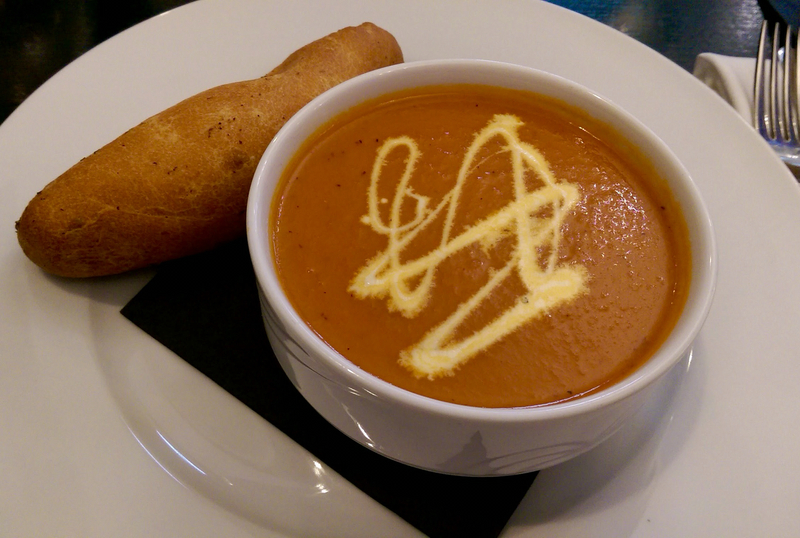 The Sunday Roast Lunch Menu offers two courses for £14.95 or three courses for £17.95 with a good range of choice. 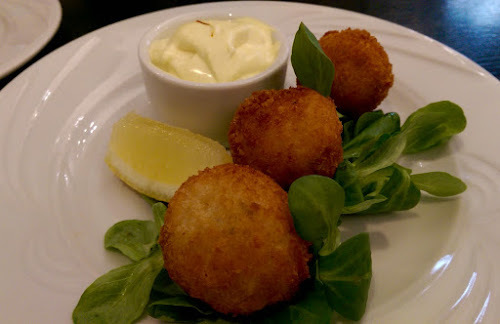 Nicola's starter was a generous portion of handmade fish cakes that were a well seasoned blend of potato, white fish and prawns, in a crispy deep fried breadcrumb coating. These were served with a lemon aioli that worked really well with the fish cakes. 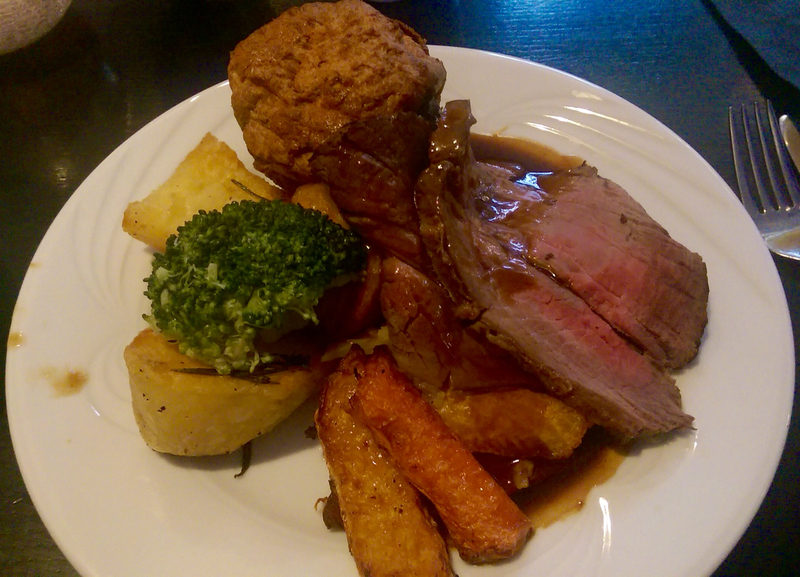 The Sunday Roast options were chicken, pork or sirloin of beef all served with vegetables, red wine gravy and Yorkshire pudding. We both ordered the beef and couldn't believe the size of the portion that was served. Two thick slices of roast sirloin, were joined on the plate by crispy roast potatoes, roasted parsnips, carrots and turnip, broccoli, buttered cabbage and a giant Yorkshire pudding. I'll start with the negatives; firstly, the chef had gotten carried away with garnishing the plate and had crowned the roast beef with a handful of lamb leaf lettuce. Lettuce has no place on a plate of hot food and once I removed it to my side plate, the dish looked better immediately. Secondly, the Yorkshire pudding was a huge letdown. It looked the part but was far to Brady and heavy to be enjoyable. Finally, the broccoli had been boiled to within an inch of it's life - still edible but not to everyone's taste. Fortunately, the positives outweighed the negatives. The roast potatoes, flavoured with rosemary, were fantastic. Crispy on the outside and fluffy inside. The carrot, parsnip and turnip were well cooked, soft and sweet, helping to balance the rich red wine gravy. The cabbage was perfect, still holding a little bite and smothered in butter - just how we like it. As for the beef - Wow! The sirloin tender and juicy and cooked medium, which isn't easy to do on a piece of meat that size. We recently had a fantastic Sunday roast beef at The Gilbert Scott in London and the sirloin at 'R' was every bit as good. Neither of us were able to finish our lunch so we passed on the dessert menu but I did enjoy a very good espresso whilst Nicola finished off her wine. If it wasn't for the 4 hour drive back to Glasgow, I'm sure that myself and Nicola could have quite easily spent a few hours in the bar listening to the pianist playing The Beatles tunes with a jazzy twist. I would like to thank the staff on shift for looking after us and making sure that we left Liverpool with full bellies. The cost of our dinner and drinks was covered by the restaurant but my write-up above is an honest review of of our experience and I wouldn't have any hesitation in recommending 'R' for dinner. The Sunday Roast menu at 'R' Bar & Brasserie offers great value for money and based on the meal that we had on Sunday, I would expect that the a la carte menu is worthy of a visit too. 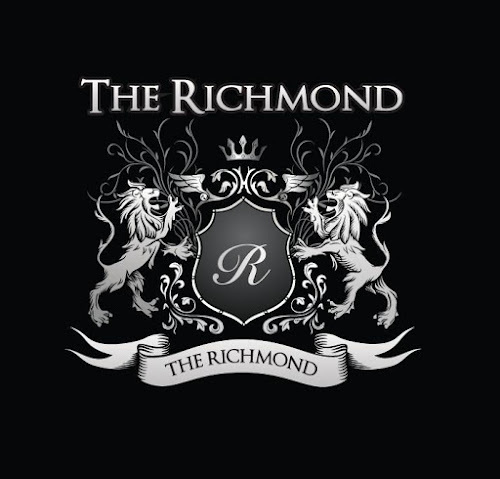 Keep up to date with news and offers from Richmond Liverpool on Facebook and Twitter. Thank you very much for sharing great information about Hatton Garden . It is difficult to find the Best Indian Restaurant in Richmond. Thanks for posting.